Mrs. Yemisi Edun holds a bachelor’s degree in Chemistry from the University of Ife, Ile-Ife and a Masters’ degree in International Accounting and Finance from the University of Liverpool, United Kingdom. 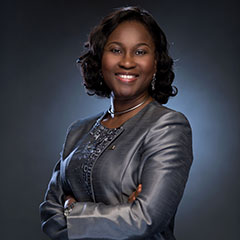 She is a fellow of the Institute of Chartered Accountants of Nigeria and a Chartered Financial Analyst (CFA). She is also an Associate Member of the Chartered Institute of Stockbrokers and an Associate Member of the Institute of Taxation of Nigeria, Member of Information Systems Audit and Control, U.S.A. and a Certified Information Systems Auditor. She began her career with Akintola Williams Deloitte (member firm of Deloitte Touche Tohmatsu) in 1987 with focus on corporate finance activities as well as audit of banks and other financial institutions. She joined FCMB in year 2000 as Divisional Head of Internal Audit and Control before assuming the role of Chief Financial Officer of the Bank.